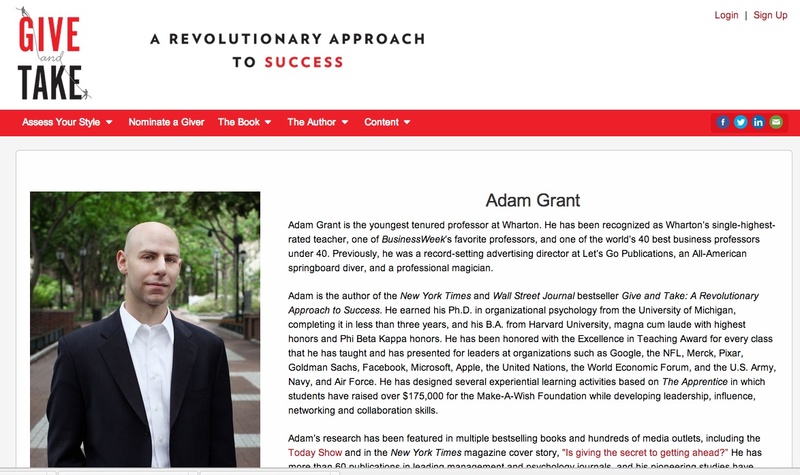 Adam Grant, a professor at the Wharton School of the University of Pennsylvania and the author of Give and Take: A Revolutionary Approach to Success , has achieved some fame and success with his writing and speaking about the value of generosity. You can read this earlier Construction Marketing Ideas blog posting, quoting a New York Times magazine article, where you can learn more about the ironies here — notably that ‘givers’ are either the most — or least — successful in life. The challenge: To avoid being taken advantage of by the “takers,” yet, to achieve the level of givingness, that you provide a lot of genuine value to as many people as possible, without straining ourselves or being exploited by the manipulators out for number one. 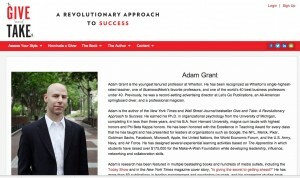 I learned about Adam from Matt Handal, who like Tim Klabunde, practices these concepts in daily life. Handal reached Grant and interviewed him for a podcast. The audio quality is far from perfect, but the ideas — and the way both Handal and Grant communicate — are enlightening. Both Grant and Handal make it clear that the concepts here are especially relevant for architects and engineers. They don’t speak about contractors — not their primary marketing focus — but I sense that the contractors, sub-trades and suppliers who master the art of giving also do the best in their fields. Most popular psychological arguments and perspectives, of course, have limitations as well as strengths. I think, for example, that we often revert to the mean; that is, we become “matchers” — and it requires quite a bit of energy and effort to truly be an effective giver. Yet we can still learn much here, and I encourage you to listen to Handal’s podcast. Previous articleThe customer experience — can we truly get it right? A key marketing question: Would you buy your own services?